Well, this client had a couple of those mingled with items from both of her parent’s houses that they gave to her after she moved into her own home. So, those few bottles… times three. First, pulled everything out of the closet. We then went through each container and bin item by item and put all of the similar items in piles together, organizing them by type. We had skin care, hair care, make-up, medicine, and vitamin piles. Anything that was broken, almost empty, or had missing pieces, we tossed (and I am vveeerrrryyy liberal in my tossing of these types of items!). Anything substantial that hadn’t been used in a while and was a donate-able item, we put it in the donate pile. When one pile became too big, we broke it up into sub-piles, so skin-care also had soap, and lotion as sub-piles. It’s best to start piles as each item is being sorted rather than starting with a few basic piles. As you touch each item, place it in the appropriate pile. Never put items to the side with intentions of “categorizing it later” because, most likely, you won’t. Anything that was a duplicate item, we combined. This client had already bought several small, clear containers to store the items in. As we worked our way through the items we started storing the piles in the clear containers. The more we sorted, the more clear it was what the types of containers would need to be labeled as. It’s a good idea to save labeling for the very end, we had several containers that we had to trade out because the items didn’t fit. After we took out the trash and donate items, we were left with clean, neat, and easy to access organized containers of bathroom items. We labeled the containers according to their contents and placed them back into the closet. She used the bottom two shelves to house laundry baskets out of sight. Now she can easily find what she’s looking for and will save money by not having to buy any duplicate bathroom items until she uses up what she has. 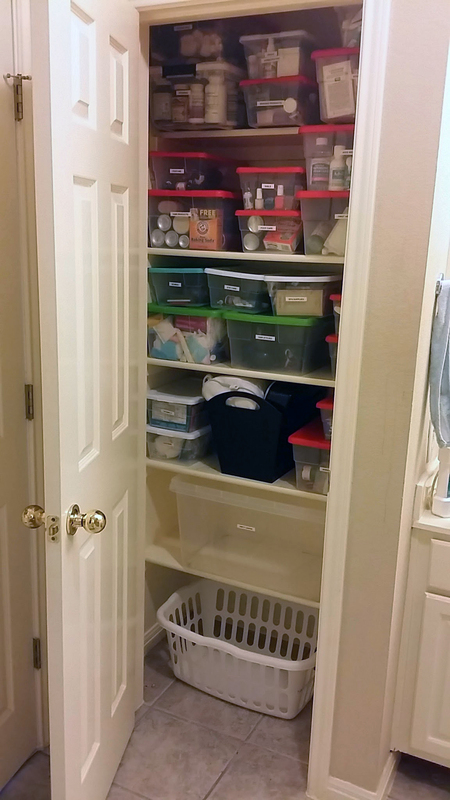 Previous Previous post: From Closet Chaos to Closet Tidy!